Knights of Creativity Spirit & Ale: Denken. Getränk. Seien Sie Fröhlich. On Evansville’s West Side, just three blocks from where my father was born and grew up (and where I lived for a short time) is a three story brick building that was built in the early 1900s. If you listen closely, you can hear the sound of a German Choir or Brass Band playing "Roll Out The Barrel." It's the home of Germania Meannerchor, a German social and singing club founded over a century ago. In 1900, Evansville had around 70,000 residents with about 40% of them German immigrants -- who often preferred to be with fellow countrymen. This resulted in a large number of German organizations being formed that enabled the immigrants to gather socially and continue various aspects of German life, including singing clubs like Germania Meannerchor. 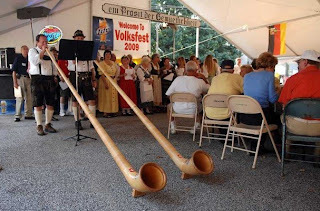 JASON CLARK / Courier & Press ABOVE: Evansville residents Charlie Haas, left, and Dave Wires perform songs on their Alphorns as the annual Volksfest at Germania Maennerchor kicks off. It wasn't too long after this particular club got started that that “war clouds broke out over our land like a bolt of lightning from heaven.” My Großvater Kuhn was one of the many Evansville German immigrants who went overseas to fight for the U.S. to help make the world safe for democracy. He came back from "The War to End All Wars" to discover a strong anti-German sentiment which halted many German public events (even the German newspaper was stopped). 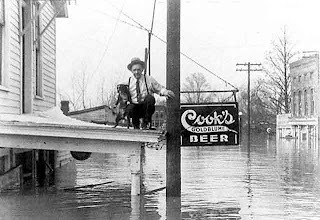 Gradually, as the dark years of the 1st World War faded, Germania grew strong enough to survive The Great Depression, Prohibition, and the devastating Ohio River Flood of 1937. However, it wasn't long before war clouds blanketed the world, and anti-German sentiment once again ended the festival during WWII. 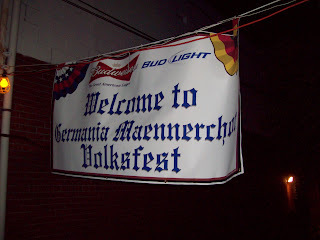 Despite all these setbacks, Germania survuved and the annual Evansville Volksfest finally resumed in 1962. 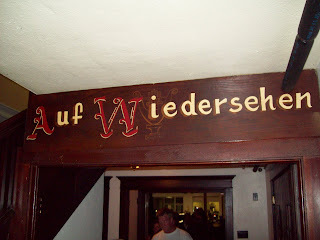 It has been an August tradition ever since -- continuing to machen Sie fröhlich (make merry). 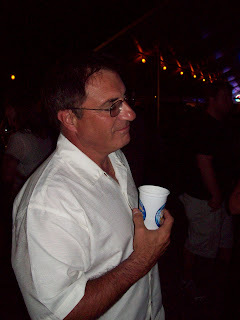 and I took Sir William of Kegler to the Volksfest to partake in our share of eating, drinking, and being merry. 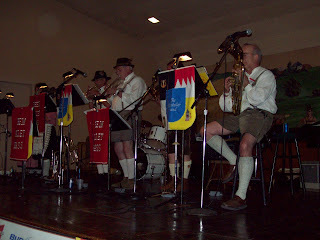 Under a full moon, we ate, drank, and listened to Germania’s own Rhein Valley Brass band (and “modern" music bands). 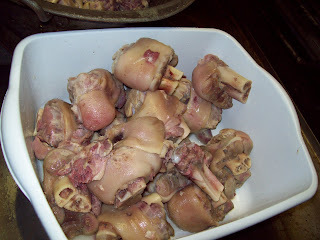 This year over 12,000 people (over three days) consumed something like 2 tons of bratwurst, 2,000 pounds of pig knuckles (yes, that's what I ate!) 95 gallons of German potato salad, 480 gallons of sauerkraut and more than 200 half-barrels of beer (not to mention countless bottles of beer). 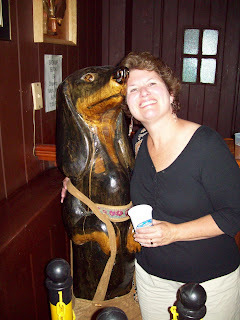 Lady Suzanne and I ready to Chicken Dance. Well said Mein Heir! Ein Grossest Bier, Bitta! It seems every year for at least the past 15 years, I have been out of town during the Volkfest. Always one of my favorites...I must put it on my calendar for next year; however, fate tells me it will also be on the same weekend as Lollapalooza again. In that case...Girls in shorts over men in shorts...and Rock N Roll over Brass Bands will prevail! It's always nice to reconnect with your heritage. Thanks for coming to England with me to do the same! 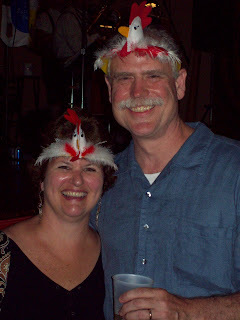 I'm sure your Grandfather would be proud of you wearing that Chicken Hat! LOL! I must admit that I would love one. Große Nacht. Sie Huhnköpfe. Nicht sure an Schwein würden die Knöchel gedacht haben, dass es mehr hambugers und Frankfurter gegeben haben würde, zum zu essen.